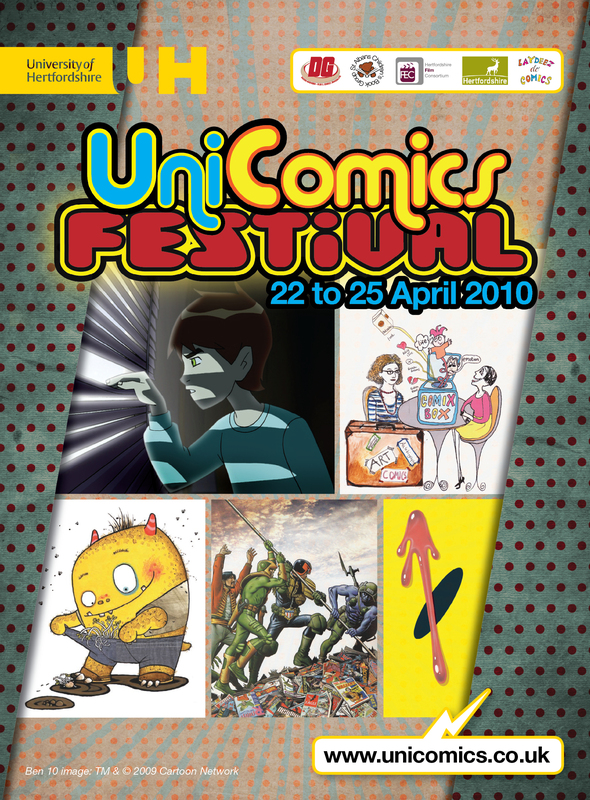 My first Comics festival! Fab, eh…? Last year, when I first got involved with University of Hertfordshire (via the Film Education Consortium that’s based there, run by Horror film fanatic Darren Elliot-Smith), it quickly cropped up in the initial meetings that Film wasn’t my only specialty – Comics were an equal, if not greater, passion of mine. Looking around the impressive campus, it quickly struck me that it’d be a great place to hold some kind of Comics-related event. Moreover, I’d mentioned that I’d been interested in putting something together, something for my home county. As it happened, other minds had been thinking in the same direction. I quickly met the manager of UHArts, the lovely Natalie Fountain,and, soon after, Maureen Irving, who runs The St.Albans Childrens Book Group. There was certainly an enthusiasm to pursue a project like this and, very swiftly, wheels were set in motion to make this idea a reality. From UHArts, Natalie brought in her marketing colleagues Katie Buckhaven (who’s also an amazing singer-songwriter!) and Melissa Marlow, Ross Renton from UH Recruitment and Animation lecturer (and comic book artist) Daniel Goodbrey. To round off our team, I invited Emma Bannister of the Herts Library Service (a committed advocate of Comics in Libraries and who’d had success with her own library events, one of which I’d hosted with Pat Mills) and, last but not least, indie cartoonists/illustrators Nicola Streeten and Sarah Lightman, who together run a very fun monthly Comics reading group in London named Laydeez Do Comics. On April 14th, 1950, a new Boys comic called The Eagle vigorously introduced some wonder in to the drudgery of post-war Britain, and, with its star strip Dan Dare: Pilot of The Future, showcased a profoundly alluring fantasy of a strong and vital Britain in then far-flung 1997 that boldly led the way in the exploration of outer space. One of the most successful comics in British history, at its height, The Eagle remarkably sold just under a million copies a week. 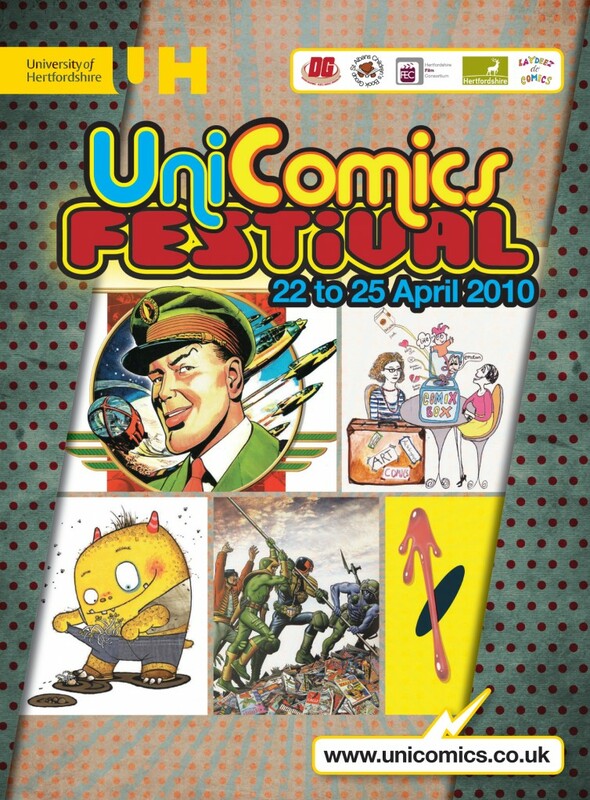 In celebration of the 60thanniversary of both this landmark, much-beloved title and its highly-memorable flagship character, UniComics presents a panel discussion to explore what is considered to be one of the high watermarks of British Comics history. The panel includes PAT MILLS (Founder of 2000AD), NICK JONES (Founding editor of Titan Book’s Dan Dare library), DR.WILL BROOKER (Kingston University) and GARY ERSKINE (Artist, Virgin Comcs’ Dan Dare). Sunday 25th April, 6pm. Hosted by Danny Graydon. Tickets are priced £10. I’m very excited about these – both of which will be held at the 500-seater Weston Auditorium at UH’s De Havilland campus in Hatfield – as both subjects are very close to my heart. And, in the case of the 2000AD event, I’ll have the distinct honour of speaking to three absolute heroes of mine. Their work was a huge part of my childhood and I remain a committed fan of these illustrious gents to this day. Very much looking forward to hearing Gary Erskine talk about Dan Dare, too as I loved the recent series for Virgin he did with Garth Ennis. Anyway, It’s been a real thrill putting this together – and an education, too, given that it takes my work in to a whole new arena, while staying “on subject”. I really can’t wait to see how UniComics plays out, as we are all enormously proud of what we’ve put together. So, please spread the word! Re-post, re-tweet, Digg, forward, etc, etc, etc…! !